Hope you enjoyed playing with our demo script. Now, you may be wandering: how exactly was the model trained? In this tutorial, we will focus on answering this question. We assume readers have a basic understanding of Gluon. If not, we suggest you spend 60 minutes to get started with the Gluon Crash Course . As we all know, training deep neural networks on GPUs is way faster than training on CPU. In the previous tutorials, we used CPU because classifying a single image is a relatively easy task. However, since we are about to train a model, it is strongly recommended to use a machine with GPU(s). The rest of the tutorial walks you through the details of CIFAR10 training. If you want a quick start without knowing the details, try downloading this script and start training with just one command. First, let’s import the necessary libraries into python. There are numerous structures for convolutional neural networks. Here we pick a simple yet well-performing structure, cifar_resnet20_v1, for the tutorial. Data augmentation is a common technique used for training. It is base on the assumption that, for the same object, photos under different composition, lighting condition, or color should all yield the same prediction. Here are photos of the Golden Bridge, taken by many people, at different time from different angles. We can easily tell that they are photos of the same thing. We want to teach this invariance to our model, by playing “augmenting” input image. Our augmentation transforms the image with resizing, cropping, flipping and other techniques. You may have noticed that most of the operations are randomized. This in effect increases the number of different images the model sees during training. The more data we have, the better our model generalizes over unseen images. Note that it is important to keep the normalization step, since the model only works well on inputs from the same distribution. With the transform functions, we can define data loaders for our training and validation datasets. 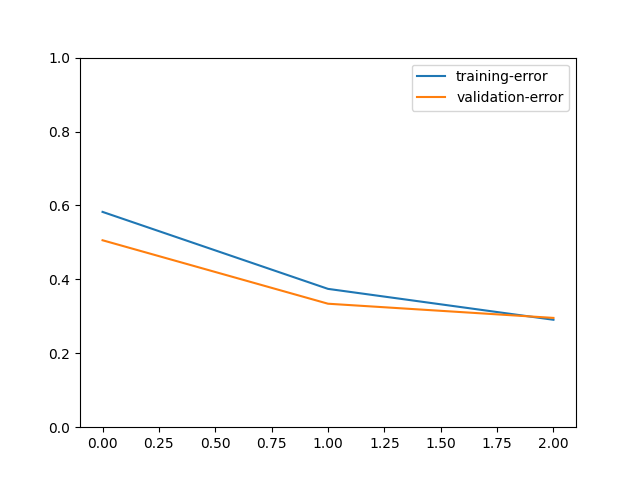 Optimizer improves the model during training. Here we use the popular Nesterov accelerated gradient descent algorithm. In the above code, lr_decay and lr_decay_epoch are not directly used in trainer. One important idea in model training is to gradually decrease learning rate. This means the optimizer takes large steps at the beginning, but step size becomes smaller and smaller in time. Our plan sets the learning rate to 0.1 at the beginning, then divide it by 10 at the 80-th epoch, then again at the 160-th epoch. We’ll use lr_decay_epoch in the main training loop for this purpose. In order to optimize our model, we need a loss function. In essence, loss functions compute the difference between predictions and the ground-truth as a measure of model performance. We can then take the gradients of the loss w.r.t. the weights. Gradients points the optimizer to the direction weights should move to improve model performance. For classification tasks, we usually use softmax cross entropy as the loss function. Metric is how we evaluate model performance. Each metric is related to a specific task, but independent from the model training process. For classification, we usually only use one loss function to train our model, but we can have several metrics for evaluating performance. For simplicity, we use accuracy as the metric to monitor our training process. Besides, we record metric values, and will print them at the end of training. Validation dataset provides us a way of monitoring the training process. We have labels for validation data, but they are held out during training. Instead, we use them to evaluate the models performance on unseen data and prevent overfitting. In order to evaluate performance, we need a metric. Then, we loop through the validation data and predict with our model. We’ll run this function at the end of every epoch to show improvement. over the last epoch. After all the preparations, we can finally start training! Following is the script. In order to finish the tutorial quickly, we only train for 3 epochs. In your experiments, we recommend setting epochs=240. 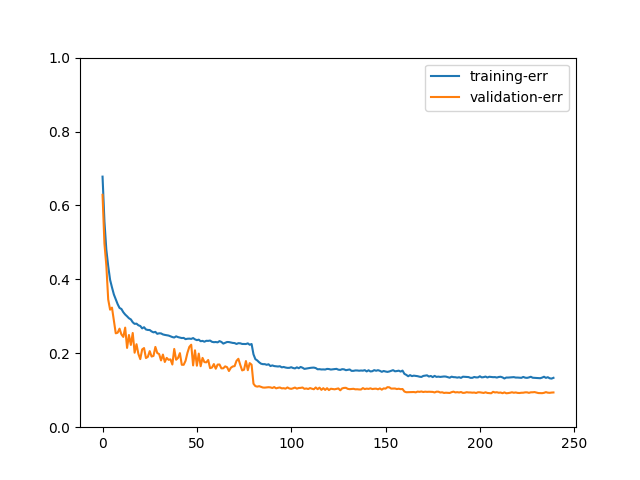 We can see that training error is much lower than validation error. After the model reaches 100% accuracy on training data, it stops improving on validation data. These two plots evidently demonstrates the importance of data augmentation. This is the end of our adventure with CIFAR10, but there are many more datasets and algorithms in computer vision! If you would like to know how to train a model on a much larger dataset than CIFAR10, e.g. ImageNet, please read ImageNet Training. 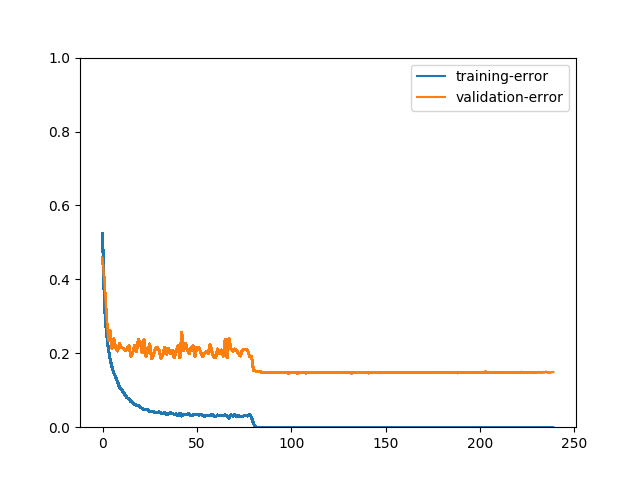 Or, if you want like to know what can be done with the model you just trained, please read the tutorial on Transfer learning.